Raise your hand if you have experienced long car rides with children, or as a child yourself, that was full of whining and complaining during the whole trip! I got lucky. I was blessed with the greatest traveling companions in my children. They never whined or complained. They didn’t even ask to use the bathroom! I would have to ask them if they needed me to stop! The worst traveling experiences we had was that one of my girls got car sick pretty easily, but she was usually able to tell me in time for me to pull over, usually. But that’s it really, and I can handle cleaning up vomit in my car much better than whining and complaining! I feel bad for families whose car rides are more like hell on wheels. I just can’t relate when people share stories of car rides that were full of “Are we there yet? Are we there yet?”, or fights between siblings in the backseat, or someone yelling, “Don’t make me pull this car over!” Like I said, I really was blessed with the best traveling companions. 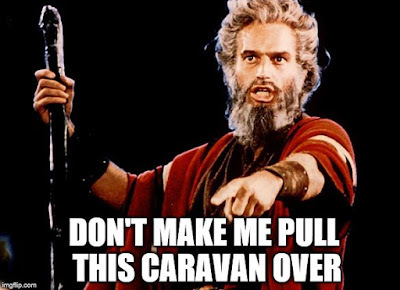 Unfortunately for Moses, he was not. We really haven’t skipped a whole lot since last week’s story of the Exodus. After escaping the Egyptians through the Red Sea, the Israelites continue their journey through the wilderness. And the traveling doesn’t go well. Talk about horrible traveling companions! Trust me, you would not want to go on a road trip with them! They griped, and whined, and complained the whole trip! Granted, it was a forty-year road trip, but still! I don’t know how Moses kept his cool as well as he did, without yelling “Don’t make me pull this car over!” every five minutes of those forty years! And it’s not so much that they were constantly complaining about not having enough water or food, those things are important and so those complaints can be overlooked. But at one point they asked, “Is the Lord really with us or not?” I’m imagining Moses hearing that and saying, “Are you kidding me right now? Do you not remember, two walls of water, one on the right, one on the left, waving at fishes swimming by? And you’re wondering if God is really with you or not?” Like I said, the worst traveling companions ever! So it comes as no surprise that God stops at a rest area called Mount Sinai. Clearly, everyone needs to get out and stretch their legs, and take a break, before anyone loses their temper and kills someone. And it’s there, at that mountain, that God says, we need to talk. If this is going to work, you and I, we need to lay down some ground rules. Because I promised to be with you forever, and we are already getting on each other’s last damn nerve! And so, God gives Moses the Ten Commandments to share with them. And the first thing I want to point out about them is that they really shouldn’t be read just as a list of laws. I kind of think that the author missed the boat by calling them commandments. As a wise colleague pointed out to me, another way of thinking of them are as vows or commitments, rather than just laws or commandments. For these are really how God has envisioned our relationship working, both with God and with each other. So, as an alternative, try thinking of them as commitments, or even as vows that we make, one to another. And speaking of relationships, the next thing I’d like to point out about these ten vows, are that some of them are directed at God’s relationship with us, and some of them are directed at our relationship with each other. Now, what’s significant about that is, you’d think, God would have just split those down the middle right? Here’s five for you and I, and here’s five for you and each other. But no, only the first three are for our relationship with God: have no other gods; have no idols; and do not misuse God’s name. That’s it. Pretty straightforward, in spite of the fact that they still continue to confound us. The rest of them, the last seven, are all about our relationship with each other. And that communicates a lot to us. That tells us, that our relationship to each other, is more important to God, than our relationship with God. Or, if that’s too hard for some of you to swallow, hear it this way, our good relationships with each other, are how God wants to be in good relationship with us. The two relationships are not exclusive. We cannot be in poor relations with each other and expect our relationship with God to be ok, or vice versa. It just doesn’t work that way. The two go hand in hand. And they either feed and nourish one another, or tear down and destroy one another. There’s no in-between. Think of it this way. How many of your relationships with people are measured by how they treat other loved ones in your life? For instance, let’s take this “random” example. Let’s say you have a daughter who has been in a long-term relationship, and let’s say you’re about to meet this boyfriend for the first time. And your spouse tells you how much said daughter is hoping you’ll like said boyfriend. Now, whether you “like” him or not is not the bottom line is it? How he treats her is. Your relationship with him, is going to be heavily based on how he treats her. The two relationships are not exclusive. They go hand in hand. And so it is with God. Our relationship with God, is heavily based on how well we treat each other. That’s how important it is for God. And what do we mean by “each other?” The people in our families at home? Think bigger. Remember the story of Joseph. The people of Bethlehem then? Think bigger. Remember the promise to Abraham. Then, every human being on the planet? Think bigger! Remember Noah’s ark. All of creation, is what we mean by “each other!” It’s all or nothing! How we interact with everyone and everything around us has a direct impact on our relationship with God, and vice versa. And these ten vows, are God’s way of breaking that down a bit for us. At the Bible study on Wednesday evening, we will talk about these individual vows in a little more detail, I hope you will join us. But before we can talk about any of these vows in more detail, we must first have this foundation, of why these are important, and what their purpose is in our lives—to nurture and strengthen our relationship with the world around us, and thereby with God. Why? Because we’re going to need those two relationships for any troubling times ahead. For God knows that in spite of how much the Israelites have to complain about at this point in the narrative, more troubling times are ahead for them. And God is doing God’s best, to prepare them for that. May the lessons they learned, prepare us as well, for every trouble that life throws at us. Thanks be to God. Amen.